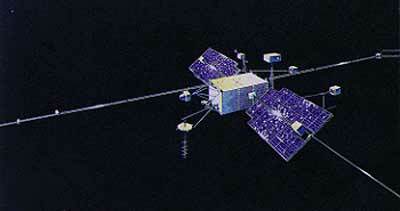 The OGO (Orbiting Geophysical Observatory) series was a series of large, complex research satellites. OGO consisted of a main body that was parallelepipedal in form, two solar panels, each with a solar-oriented experiment package (SOEP), two orbital plane experiment packages (OPEP) and six appendages EP-1 through EP-6 supporting the boom experiment packages. The main body was attitude-controlled by use of horizon scanners and gas jets and was designed to point toward the earth (Z axis). The axis connecting the two solar panels (X axis) was designed to oscillate in order to remain perpendicular to the earth-sun-spacecraft plane. The solar panels activated by sun sensors could rotate about this × axis in order to obtain maximum radiation for the solar cells and concurrently orient the SOEP properly. The OPEPs were reoriented on either end of an axis that was parallel to the Z axis and attached to the forward end of the main body. These OPEP sensors normally were maintained looking forward in the orbital plane of the satellite. To maintain this orientation, the OPEP axis could rotate over 90 deg. In addition, an angular difference of over 90 deg was possible between the orientation of the upper and lower OPEP packages. The purpose of the OGO 1 spacecraft was to conduct diversified geophysical experiments to obtain a better understanding of the earth as a planet and to develop and operate a standardized observatory-type satellite. Due to a boom deployment failure shortly after orbital injection, the spacecraft was put into a permanent spin mode of 5 rpm about the Z axis. This spin axis remained fixed with a declination of about -10 deg and right ascension of about 40 deg at launch. The initial local time of apogee was 2100 h. OGO 1 carried 20 experiments. Twelve of these were particle studies and two were magnetic field studies. In addition, there was one experiment for each of the following types of studies: interplanetary dust, VLF, Lyman-alpha, gegenschein, atmospheric mass, and radio astronomy. Real-time data were transmitted at 1, 8, or 64 kbs depending on the distance of the spacecraft from the earth. Playback data were tape recorded at 1 kbs and transmitted at 64 kbs. Two wideband transmitters, one feeding into an omnidirectional antenna and the other feeding into a directional antenna, were used to transmit data. A special-purpose telemetry system, feeding into either antenna, was also used to transmit wideband data in real time only. Tracking was accomplished by using radio beacons and a range and range-rate S-band transponder. Because of the boom deployment failure, the best operating mode for the data handling system was the use of one of the wideband transmitters and the directional antenna. All data received from the omnidirectional antenna were noisy. During September 1964, acceptable data were received over 70% of the orbital path. By June 1969, data acquisition was limited to 10% of the orbital path. The spacecraft was placed in a standby status 25 November 1969, and all support was terminated 1 November 1971. By April 1970 the spacecraft perigee had increased to 46,000 km and the inclination had increased to 58.8 deg. OGO 2 was a large observatory instrumented with 20 experiments designed to make simultaneous, correlative observations of aurora and airglow emissions, energetic particles, magnetic field variations, ionospheric properties, etc., especially over the polar areas. The SOEP contained four experiments, and the OPEP contained five experiments. Soon after achieving orbit, difficulties in maintaining earth lock with horizon scanners caused exhaustion of attitude control gas by 23 October 1965, 10 days after launch. At this time, the spacecraft entered a spin mode (about 0.11 rpm) with a large coning angle about the previously vertical axis. Five experiments became useless when the satellite went into this spin mode. Six additional experiments were degraded by this loss of attitude control. By April 1966, both batteries had failed, so subsequent observations were limited to sunlit portions of the orbit. By December 1966, only eight experiments were operational, five of which were not degraded by the spin mode operation. By April 1967, the tape recorders had malfunctioned and only one third of the recorded data could be processed. Spacecraft power and periods of operational scheduling conflicts created six large data gaps so that data were observed on a total of about 306 days of the 2-yr, 18-day total span of observed satellite data to 1 November 1967. The data gaps were (a) 24 October 1965, to 5 November 1965, (b) 6 December 1965, to 7 January 1966, (c) 9 April 1966, to 21 June 1966, (d) 2 September 1966, to 18 November 1966, (e) December 27, 1966, to 11 April 1967, and (f) 9 May 1967, to 19 September 1967. The spacecraft was shut down on 1 November 1967, with eight experiments still operational. It was reactivated for 2 weeks in February 1968 to operate experiment 65-081A-05. The purpose of the OGO 3 spacecraft was to conduct many diversified geophysical experiments to obtain a better understanding of the earth as a planet. Due to a failure in the attitude control subsystem on 23 July 1966, the spacecraft was put into a permanent spin mode about the Z axis. Both the orientation of the spin axis and the spin period were variable, the latter usually in the range 90 s to 125 s. At launch, the local time of apogee was 2300 h. OGO 3 carried 21 experiments. Thirteen of these were particle studies, and two were magnetic field studies. In addition, there was one each of the following types of experiments: interplanetary dust, VLF, Lyman-alpha, gegenschein, atmospheric composition, and radio astronomy. Real-time data were transmitted at 1, 8, or 64 kbs depending on the distance from the spacecraft to earth. Playback data were tape recorded at 1 kbs and transmitted at 64 kbs. Two wideband transmitters, one feeding into an omnidirectional antenna and the other feeding into a directional antenna, were used to transmit data. A special purpose telemetry system, feeding into either antenna, was also used to transmit wideband data in real time only. Tracking was accomplished by using radio beacons and a range and range-rate S-band transponder. Routine spacecraft operation was discontinued on 1 December 1969, after which only data from Heppner's experiment (E-11) was acquired. All spacecraft support terminated on 29 February 1972. By March 1971 spacecraft perigee had increased to 16,400 km and the inclination had increased to 75.8 deg. OGO 4 was a large observatory instrumented with experiments designed to study the interrelationships between the aurora and airglow emissions, energetic particle activity, geomagnetic field variation, ionospheric ionization and recombination, and atmospheric heating which take place during a period of increased solar activity. The SOEP contained four experiments, and the OPEP contained five experiments. After the spacecraft achieved orbit and the experiments were deployed into an operating mode, an attitude control problem occurred. This condition was corrected by ground control procedures until complete failure of the tape recording systems in mid-January 1969. At that time, due to the difficulty of maintaining attitude control without the tape recorders, the attitude control system was commanded off, and the spacecraft was placed into a spin-stabilized mode about the axis which was previously maintained vertically. Initial spin period was 202 s with the mean spin axis approximately perpendicular to the orbit plane (spin period as of 12 March 1969, was 217 s). The precession period of the mean spin axis was about 5 days. In this mode, seven of the remaining experiments were turned off since no meaningful data could be observed by them. On 23 October 1969, the satellite was turned off. It was reactivated again in January 1970 for 2 months to obtain VLF observations. The objectives of the OGO 5 spacecraft were to conduct many diversified geophysical experiments for a better understanding of the earth as a planet and to develop and operate a standardized observatory-type spacecraft. At launch, the initial local time of apogee was 0944 h. OGO 5 carried 25 experiments, 17 of which were particle studies, and two were magnetic field studies. In addition, there was one each of the following types of experiments: radio astronomy, UV spectrum, Lyman-alpha, solar X ray, plasma waves, and electric field. Real-time data were transmitted at 1, 8, and 64 kbs depending on the distance from the spacecraft to the earth. Playback data were tape recorded at 1 kbs and transmitted at 64 kbs. Two wide-band transmitters, one feeding into an omnidirectional antenna and the other feeding into a directional antenna, were used to transmit data. A special purpose telemetry system, feeding into either antenna, was also used to transmit wide-band data in real time only. Tracking was accomplished by using radio beacons and a range and range-rate, S-band transponder. The spacecraft attitude control failed on 6 August 1971, after 41 months of normal operation. The spacecraft was placed in a standby status on 8 October 1971. Four experiments (Meyer, Blamont, Thomas, and Simpson) were reactivated for the period from June 1 to 13 July 1972, after which all operational support terminated. Spacecraft orbit parameters changed significantly over the spacecraft life. By April 1971, spacecraft perigee had increased to 26,400 km and inclination had increased to 54 deg. OGO 6 was a large observatory instrumented with 26 experiments designed to study the various interrelationships between, and latitudinal distributions of, high-altitude atmospheric parameters during a period of increased solar activity. On 22 June 1969, the spacecraft potential dropped significantly during sunlight operation and remained so during subsequent sunlight operation. This unexplained shift affected seven experiments which made measurements dependent upon knowledge of the spacecraft plasma sheath. During October 1969, a string of solar cells failed, but the only effect of the decreased power was to cause two experiments to change their mode of operation. Also during October 1969, a combination of manual and automatic attitude control was initiated, which extended the control gas lifetime of the attitude control system. In August 1970, tape recorder (TR) no. 1 operation degraded, so all recorded data were subsequently taken with TR no. 2. By September 1970, power and equipment degradation left 14 experiments operating normally, 3 partially, and 9 off. From 14 October 1970, TR no. 2 was used only on Wednesdays (world days) to conserve power and extend TR operation. In June 1971, the number of "on" experiments decreased from 13 to 7, and on 28 June 1971, the spacecraft was placed in a spin-stabilized mode about the yaw (Z) axis and turned off due to difficulties with spacecraft power. OGO 6 was turned on again from 10 October 1971, through March 1972, for operation of experiment 25 by The Radio Research Laboratory, Japan.